A world premiere presentation by renowned American visual artist Suzanne Lacy entitled Across and In–Between will be showcased at the Ulster Museum from the 18th to 23rd October as part of the Belfast International Arts Festival and 14–18 NOW, the UK’s arts programme for the First World War centenary. Created in collaboration with communities in Ireland from both sides of the border, Across and In–Between explores the profound impact the border has on the lives of people who live there. The project is in two parts, The Yellow Line and the Border People’s Parliament, deeply engaging border communities and over 300 residents in collaboration to create an artwork that stirs public conversation. 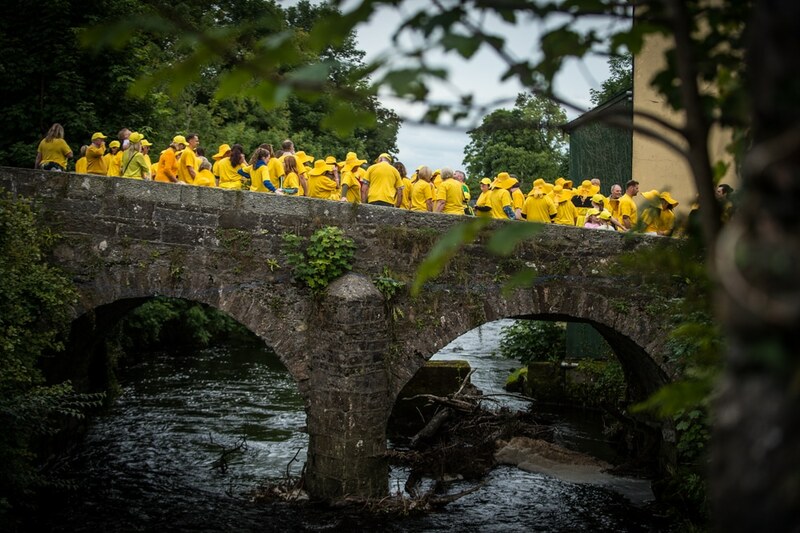 A three–screen film projection, The Yellow Line, was made with participants including farmers, horse–owners, scouts, hikers and villagers from communities across the Fermanagh, Donegal, Leitrim, Cavan and Monaghan border–line. It will be projected upon the front of the Ulster Museum building each evening from 6.00pm to 9.00pm over the six–day run, supported by a temporary exhibition featuring documentary interviews and the opportunity to contribute to the conversation about the Border People’s Parliament from 10am daily. The second part of the project will see participants in The Yellow Line invited to a private event in Stormont’s Parliament Buildings during Belfast International Arts Festival. They will celebrate their involvement in making The Yellow Line and be part of the project’s final performance: a border people’s parliament, a space where border voices can consider matters of global political significance that are also, to them, intensely local. Across and In–Between has been co–commissioned by 14–18 NOW, the UK’s arts programme for the First World War centenary, and Belfast International Arts Festival, with the support of the Government of Ireland’s Department of Culture, Heritage and the Gaeltacht and Department of Foreign Affairs and Trade (Reconciliation Fund). The work opens during the Festival on 18 October 2018.